The kit has more than enough of each type of atom representative, that you are able to build complex molecules, up to a C15. It is easy to assemble what you need to build, and the disassemble tool makes dissembling the moleculses easy. This kit includes long flexible links that are perfect for making double and triple bonds, as well as medium and shorter-length single-bond links. Using it you will find it is made your organic chemistry class so much easier and very fun to play with! The chemistry kit is allowing you to visualize 3d models to get a strong grasp of the underlying biochemistry that is occurring.  What Will You Get? – 40 hydrogen,34 carbon,17 oxygen, 10 nitrogen, 6 sulfate,4 phosphorus,6 fluorine,6 chlorine,3 bromine,2 iodine, 4 metal. 157 chemical bonds, 150 parts( 60 carbon atoms and 90 bonds ),1 bond remover and 1 ABS box.It’s very helpful in explaining molecular structures.  Makes Organic Chemistry Learning Much Easier – Without a biochemistry model kit, you trying to replicate a 3d ball and stick model in your head will be ineffective when you took biology class.BUY THIS ORGANIC CHEMISTRY MODEL KIT! A geometric shape is a lot more clear to work with.It gets you one step closer to understanding why these bonds work, or why this molecule acts this way. You will seeing it makes a world of difference in your understanding.  A must-have for Organic Chemistry – It comes Comes with plenty of pieces for a majority of useful structures and a convenient box that doesn’t take up much space. It is easy to take to class or to a study session and is really helping students visualize the things learning in Organic Chemistry class. The bonds all connect well and the small bond removing tool is very handy.  Enjoy Your Organic Chemistry Class – The molecular model set is excellent for visualizing all the different molecules required to organic for organic chemistry class.The kit has more than enough of each type of atom representative, that you are able to build complex molecules, up to a C15. You can rotate the atoms, break it up again, and put it back together in the form of a ball and stick model,and the disassemble tool makes dissembling the moleculses easy.  PERFECT MUST HAVE GIFT for a Organic Chemistry Students, chemical engineering student, biochemistry kinesthetic learner.If you are in a chemistry, whether organic or inorganic, or any biology class, get this molecular model kit! It’s a win-win situation. Try our products for 30 days and if there are any quality problem, we promise to offer you a prompt and full refund. The Duluth Labs Set will bring to life concepts such as chirality, conformations and isomers to help you relate the physical and chemical properties of compounds to their molecular structures. Get hands on experience with three dimensional topics covered in Organic and General Chemistry courses such as Lewis structures, Newman projections and wedge-dash diagrams. The versatile molecular set accelerates memorization by allowing you to visually create common functional groups such as ketones, aldehydes, alcohols, thiols, amines, aromatics and most other families of organic compounds. The modeler basic tools set is suitable for a beginner and advanced modeler as well. Because the Modeler Basic Tools are very shape, please use with care and take they away from children. ● FUNCTION—EASY TO USE—The modeler basic tools set is suitable for a beginner and advanced modeler as well.You can use it to manufacture many toys,such as cars, robots, cartoon, buildings, airplanes and other crafts. ● FULL RANGE AND COST EFFICIENT—Package include : 4 X Sandpaper;1 X Cutting pad;1 X Electric grinding machine and 5 pcs Grinding head;2 X Screwdriver;5 X Files; 1 X Separator; 1 X Steel rule; 7 X Polishing Block; 5 X Tweezers;1 X Graver and 1 Box Blade;1 X Diagonal Pliers;1 X Hand drill; 1 X 10pcs Drills. ● DURABLE—Hand drill is tightly clamped and has high hardness,made by stainless steel and anti-skid design.The drill is packed in plastic case to protect it.The tweezers are made of high strength stainless steel, anti-static, anti-acid, anti-corrosion,heat-resistant.And the tweezers also can be used for a long time. ● LIGHTWEIGHT AND PORTABLE—Packaged in a sturdy cardboard box.When you use them, you will feel more convenience.You can take it to anywhere,use it in anytime.It will be a good assistant to you. ● Sold by LENX—Please make sure this product is soled by LENX.If there is any question about the product,please don’t hesitate to contact with us.Looking forward to your masterpiece!! !And also you can share your works on this page. Veer off the beaten path and let your imagination run wild with the 25-in-1 Off-Road Racer Motorized Building Set. This Erector by Meccano model comes with over 25 possible vehicle combinations. Engineers-in-training have full license to build, dismantle, and build again! Even after 25 combinations, the possibilities are endless. Use your imagination to construct a road racer the world has yet to see! This build-your-own model is set at an exciting intermediate complexity level, with a build time of 1-3 hours. Once built, models measure 9.5” long, 6” wide 6” tall. Challenge the young innovator in your life to tackle this solo, or team up and bond over the excitement of building a cool new motorized truck! As a S.T.E.A.M toy, the Off-Road Racer challenges builders to develop and apply skills used in the areas of science, technology, engineering, art and mathematics. Kids learn and grow while having fun! Even after building, the Off-Road Racer comes with a working motor, so young engineers can race with their friends. Now that Erector and Meccano are building together, young thinkers all over the world can start inventing with their first Erector by Meccano S.T.E.A.M. set. Experience real building with real tools, and build the Erector by Meccano Off-Road Racer! 25 WAYS TO BUILD: Explore new territory with the 25-in-1 Erector by Meccano Off-Road Racer Motorized building set. Build this truck any way your like! S.T.E.A.M. BUILDING KIT: The Off-Road Racer is a S.T.E.A.M. toy designed to intellectually stimulate kids in a fun way! Use this as a bonding project or challenge kids to build this solo. REAL METAL PARTS: For an authentic building experience, the Erector by Meccano Off-Road Racer features real metal parts and a working motor. The Erector by Meccano Off-Road Racer is recommended for kids aged 9+. 2 real tools included. Intermediate complexity level. Build time of 1-3 hours. 3 x AA batteries required (not included). From the immensely popular side story “Gundam seed Astray” comes the Guardian of the “declaration of the sky”, gold frame amatsu Mina, to the RG series! the stealth functions of amatsu Mina have been independently investigated. The differences in texture of the external parts of the actual mobile suit have been realistically recreated through the use of the colored plastic and different materials. 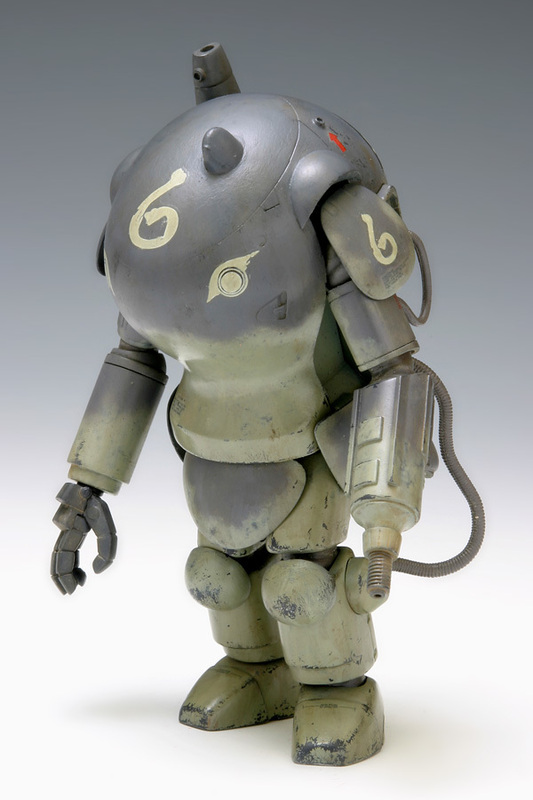 The arms are movable and have the ability to be extended and retracted, a mechanism that is unique to the RG series. The rear-mounted maga no ikutachi incorporates deployment, extension and retraction gimmicks. Detailed gimmicks have been recreated based on the actuator and other mechanisms used on the actual mobile suit. Amatsu mina’s extensive weaponry has also been replicated with superb detailing. The spear-shaped weapon, okitsu no Kagami, used for both offense ande defense, is crafted utilizing solid and clear parts for the first time in the 1/144 scale. Set includes okitsu no Kagami x1, Trikeros Kai x1, totsuka no tsurugi x2, tsumugari no tachi x1, and magashira hoko x2. Runner x14. Realistic decal x1. Wire (1.9×150 mm) x1. Wire (1.5×290 mm) x1. Instruction manual x1. The stealth functions of amatsu mina have been independently investigated. Set includes okitsu no kagami x1, trikeros Kai x1. 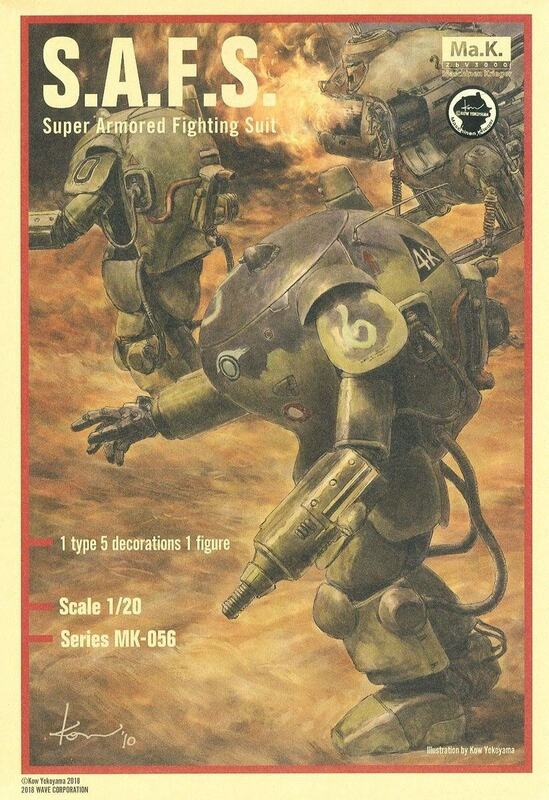 Maschinen Krieger (Ma.K ZBV3000) is a science fiction universe created by Japanese artist and sculptor Kow Yokoyama in the 1980s. The franchise originally began as the science fiction series SF3D which ran as monthly installments in the Japanese hobby magazine Hobby Japan from 1982 to 1985. To develop the storyline, Kow Yokoyama collaborated with Hiroshi Ichimura as story editor and Kunitaka Imai as graphic designer. 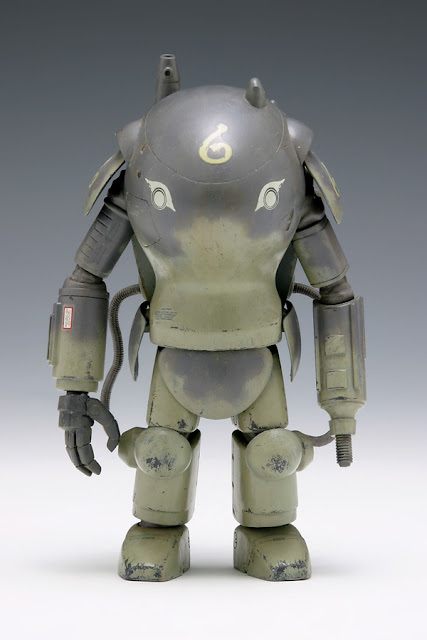 The three creators drew visual inspiration from their combined interest in World War I and World War II armor and aircraft, the American space program and films such as Star Wars, Blade Runner and The Road Warrior. 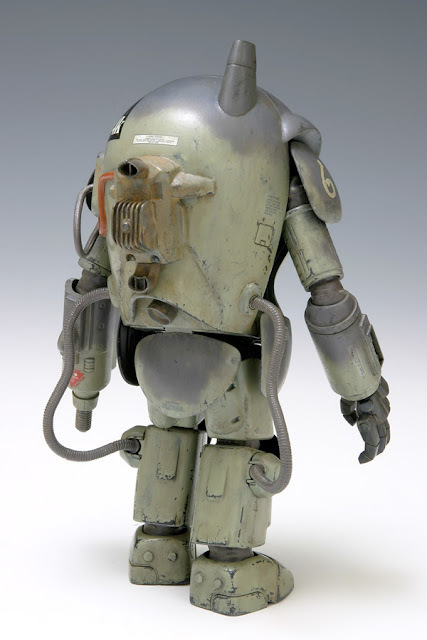 Inspired by the ILM model builders who worked on Star Wars, Yokoyama built the original models from numerous kits including armor, aircraft, and automobiles. He mostly concentrated on powered armor suits, but later included bipedal walking tanks and aircraft with anti-gravity systems.